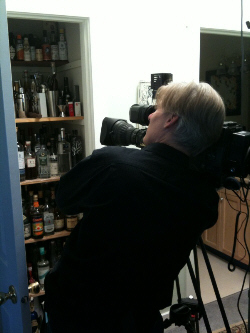 Tomorrow night, I’ll get a fuller picture – pun intended – of how good or bad media attention can be when a television segment focusing on me, my booze-geekery and my liquor closet (pictured at right, with cameraman) runs locally here in Seattle on KING-5’s Evening Magazine. The show starts at 7:00 pm Pacific on Wednesday, March 3, and my segment will go up on Evening Magazine’s website around that time (I’ll link to it once it’s available). So tomorrow night, you can watch me mangle quotes, try to look sincere as I “read” a book during a voiceover, and mix possibly the world’s worst Police Gazette Cocktail or Last Word (while standing behind the bar at Zig Zag, no less), all up there on your flat screen. I’m certainly not a natural in front of the camera, so on Wednesday evening I’ll be crossing my fingers, mixing a drink and hoping like hell that I didn’t make myself come off too foolishly (seriously, it’s insane to try to make a decent drink when you have to keep adding booze & ice for the camera shots, and trying to pretend that every slosh or barspoon fumble isn’t going to make you look like an idiot). Anyway, tune in on Wednesday, or check out the online video – and a huge thanks to the folks at Zig Zag Café for letting us take over the bar for an hour (especially to Erik for keeping a straight face while I butchered a couple of drinks for the camera), and for letting me stand in Murray’s spot during the segment so that I could absorb some of the awesomeness. Obv. not in the viewing area, but lifting a colortini in your honor. Awesome, Paul! My DVR is set. Will you be archiving the show so we non Seattle-ites can see it? Looking forward to it. Hail to cocktail geekdom! Yeah, someone Tivo that baby and make it available on the Intarwebs. I love that you actually have everything in a closet – what does that mean when it comes out?